If you saw any of the 2014 CrossFit Games in July, I'm sure you noticed some of the incredible physiques cheering in the audience and competing in the arena. When I first started CrossFit 10 years ago, the emphasis was on cardio. Back then, most participants had that lean, supple look. Since then, CrossFit has exploded into a more well-rounded and intense training protocol. Today, CrossFitters have to be strong, powerful, and able to work for long periods of time. As the sport has evolved, so have the bodies of CrossFitters. They are now bigger and leaner than ever. In order to survive the evolution of CrossFit, I had to come up with mental strategies in order to cope with the overwhelming workload. If not, the demands of CrossFit would have crushed me and forced me to quit the sport I enjoy so much. Although I've applied these mental strategies to my improvement in CrossFit, they aren't exclusive to CrossFitters. These mental strategies are applicable to everyone—from the competitive bodybuilder to the marathon runner. Use them to make yourself better, no matter your sport or your goal. When you learn how to push your body to the limit, you expect your physique to look better than ever. Many gym-goers struggle to learn how to push themselves beyond the limit of their perceived limitations. If you're tired, you stop, right? The problem with pushing yourself only so far is that your body will stop changing. As your body and mind grow accustomed to a particular workload, they'll stop making progress. What CrossFit has taught me, and what I think everyone can apply to their own fitness, is the idea that the body can always do more. The average CrossFit WOD (Workout of the Day) is deliberately designed to fatigue your body to the point where you don't think you can go on. The lesson in the WODs is that when your body is totally exhausted, you must look for a different energy source. And guess what? Your body will do it. You must learn to rely on your mind to push you through the suffering. It is in your mentality, not your 20-inch biceps, that your true power lies. When you learn to depend on your mind, you'll be amazed at the unlimited amount of strength and endurance that your body has. "Whatever you convince your mind to believe," says Bobby Ashhurst, CrossFitter and Pursuit Rx athlete, "will become a reality." Once you discover that your mind can will your tired body to lift heavier weights, do more reps, and perform longer, you can develop a better physique, perform better in sports, or be mentally tougher for any aspect of life. These big weights can be scary. They can push you beyond your comfort zone and make you feel like a total wuss. That's a good thing. The worst thing you can do is be overly hesitant to try again. Don't live in your comfort zone! Instead of lifting weights you know you can handle all the time, plan for PR attempts, try that bigger dumbbell, and constantly strive to get better every time you walk into the gym. Don't wait any longer. Go for a new one-rep personal best in your deadlift or back squat today. If you fail, who cares? Just adjust your training and try again in a few weeks! Go to any commercial gym and I bet you'll see most guys doing biceps curls or bench presses, and most gals doing cardio or working on their butts. A lot of people spend the majority of their time in the gym working on their favorite muscle groups or doing their favorite exercises. Every CrossFittter has a weakness. For me, it was the Olympic lifts. For others, it might be handstand push-ups or rowing. To be successful in the gym, you must have the mentality to overcome your weakness. When you work on movements you don't usually do, you exert your muscles in new ways and recruit different fibers you normally don't use. This stimulates growth and builds overall muscle in your entire body. By constantly learning new and challenging physical skills, you force your body to grow all over. 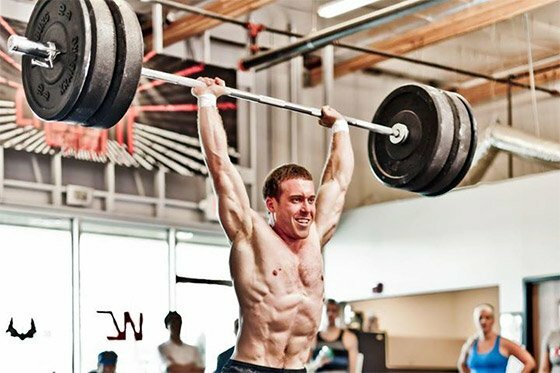 This is a huge reason why veteran CrossFit men and women look great from top to bottom! You don't have to work out in a CrossFit box to achieve similar results. 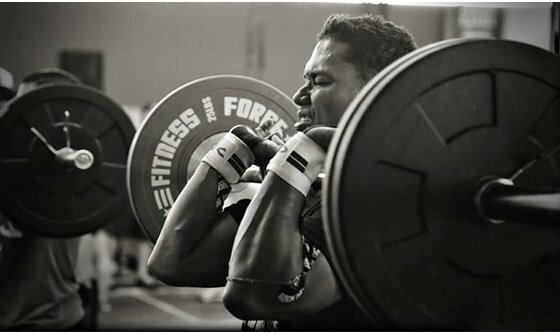 Pick a new movement you've never tried before, like front squats or power cleans, and give it a go in your next workout!